The Phillies didn't do much hitting Saturday night in Miami but their Triple A affiliate sure did. In a game that featured a combined 43 hits and 15 home runs - yes, seriously - the Lehigh Valley IronPigs defeated the Rochester Red Wings, 20-18, Saturday. 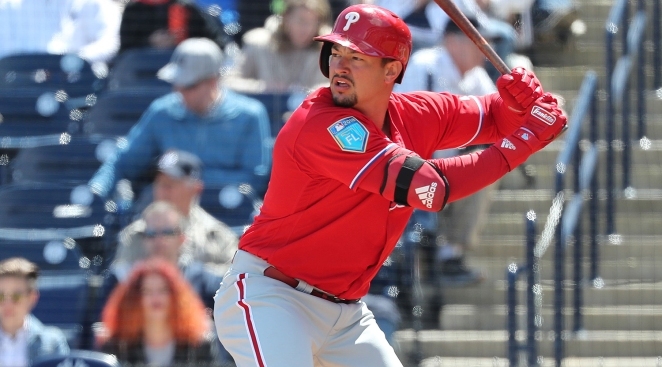 Dylan Cozens, Sean Rodriguez, Andrew Romine and Jan Hernandez each hit two home runs for the Phillies' Triple A affiliate, which is 8-2. Rodriguez and Hernandez drove in five runs apiece, Romine had four RBI and Cozens had three. Through 10 games, the powerful but whiff-prone Cozens has hit .200/.341/.600 with four homers, 10 RBI, a triple, eight walks and 17 strikeouts. Roman Quinn played center field and led off, going 2 for 7 with a pair of runs scored. Edubray Ramos allowed one run in the ninth but earned the save. Would Realmuto, Hoskins consider contract extensions with Phillies? At The Yard Podcast: How can Pivetta improve? Odd man out for Quinn?